It happens to the best of us. We are sitting at work or school and bam! We are hit with a craving for something salty or sweet or both; we get hit with a snack attack. For those of us who are watching what we’re eating, this is disheartening feeling. But have no fear! Snacking doesn’t necessarily mean “unhealthy.” In fact, there are a lot of great healthy snack recipes out there that will battle your craving and satisfy your hunger. For me, my go-to munchies are chips. I have a bad habit of eating an entire bag of chips (even the family size bags) in one sitting. I feel that it’s disrespectful to the chips if you don’t eat them all at once; the ones left behind are never the same after sitting for a few days in an opened bag. Plus, when I snack, I’m usually watching TV so I’m not really paying attention to what I’m doing. I tell myself I’ll have just a few, and the next thing I know, the Big Bang Theory is over and my bag of Doritos is gone. I’m not proud of this. I decided I needed an alternative to nacho cheese flavored tortillas. So I went hunting for some healthier snacks (not necessarily chips) than a store-bought bag of junk food. The secret to snacking is to find something small but filling. If you only eat a bite of three, then you won’t feel too guilty. Bonus points if this kind of snack holds you until your next meal. 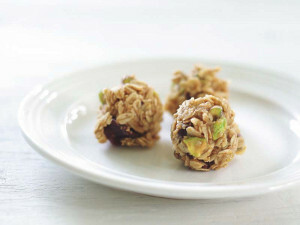 That’s why these No Bake Pistachio and Cherry Granola Bites are so awesome. These little balls of chewy goodness are packed fiber and protein that will definitely make you feel full after just two or three. Since they are made with whole, all-natural ingredients, these are healthy snacks that will leave you feeling good about your choices. Another one of my weaknesses are fries. I love them. 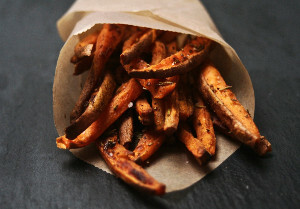 Sweet Potato Fries are amazing; these are seasoned with rosemary and garlic, adding some savory flavor to their natural sweetness. Plus, they are baked, not fried, making these even healthier for you. I’d honestly make these every day if I had the time. Make no mistake: nuts are awesome. Not only are they delicious, they are packed with wonderful nutrients and natural oils that are super good for you. 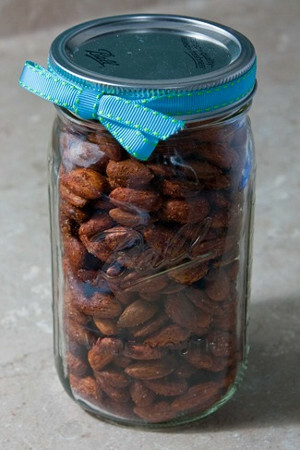 This recipe for Smoked Paprika Roasted Almonds simply takes this natural snack food and pumps it up to a whole different level of flavor. Just a handful of these nuts, and you get a satisfying, crunchy snack that will quiet those cravings and carry you through your mid-morning or afternoon. Finally, chips. 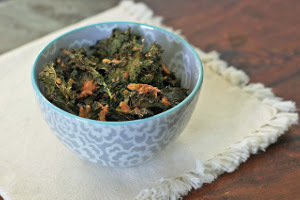 Yes, there are such things as healthy chips as these Gluten Free Garlic and Parmesan Kale chips prove. You will get all the salty, crispy, mouthwatering goodness of a chip, but none of the fat or calories. Since kale is a superfood, this is a very healthy snack recipe. You will definitely thank yourself for taking the extra time to bake these up instead of running to 7-Eleven. These Healthy Zucchini Chips are named so for a reason. 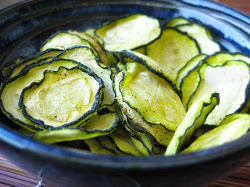 Baked slices of zucchini crisp up, making them much more like chips than vegetables, plus they are much better for you than any processed snack. You will have just as hard of a time stopping yourself from eating the whole batch as you do with regular chips. These might just be my new favorite thing. What’s your favorite snack food? No worries if it’s not healthy. Tell us below! I have a tendency to gravitate towards snacking on junk food as well, even if I have healthier options in the house. For me, changing my eating habits starts right at the grocery store. By not adding cookies to my grocery list, I won’t buy them! Instead, I stock up on fruits and veggies. Preparing food at the beginning of the week saves time, as it allows me to grab food on the go. Snap peas and red bell pepper slices are a personal favorite! This has a great variety of healthy snacks, I especially like the idea of making my own zucchini chips since it can be difficult to eat healthy while at school.